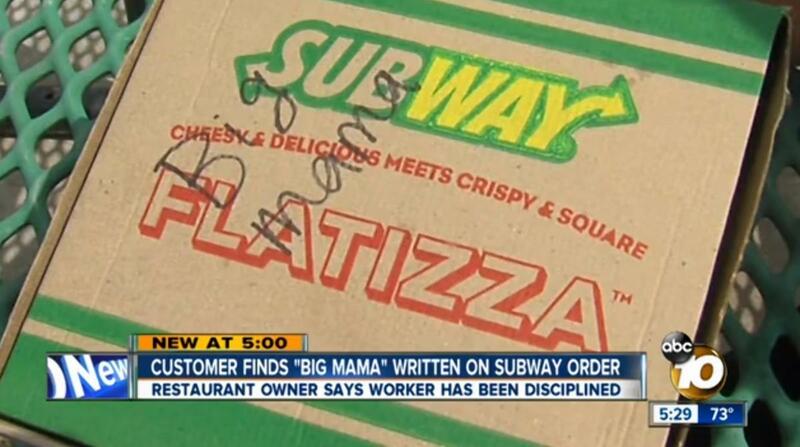 A woman in California says she’s planning legal action against the Subway chain of sandwich shops because a Subway worker wrote the words “Big Mama” on her order and because was less-than-thrilled by the company’s response. According to the NY Daily News, the incident happened on March 27, when the customer placed a to-go order for her and her family. When she got home and began sorting through the food, she noticed that the box for her Flatizza flatbread pizza thingy had the words “Big Mama” written on it. She called the store right away, where the manager admitted that an employee had written those words. A call to Subway’s corporate office went unanswered, but a subsequent letter — in which she says she suggested better training for employees but made no monetary demands — sent to Subway HQ resulted in an offer of $5,000 if she agreed to sign a confidentiality agreement and waive her right to sue under California law. She has rejected Subway’s offer and her lawyer tells the News that a lawsuit is imminent.